Work commitments meant that I didn't arrive in Tirano until the afternoon, so by the time I'd checked into my lodgings there was no chance of me doing a very long ride. 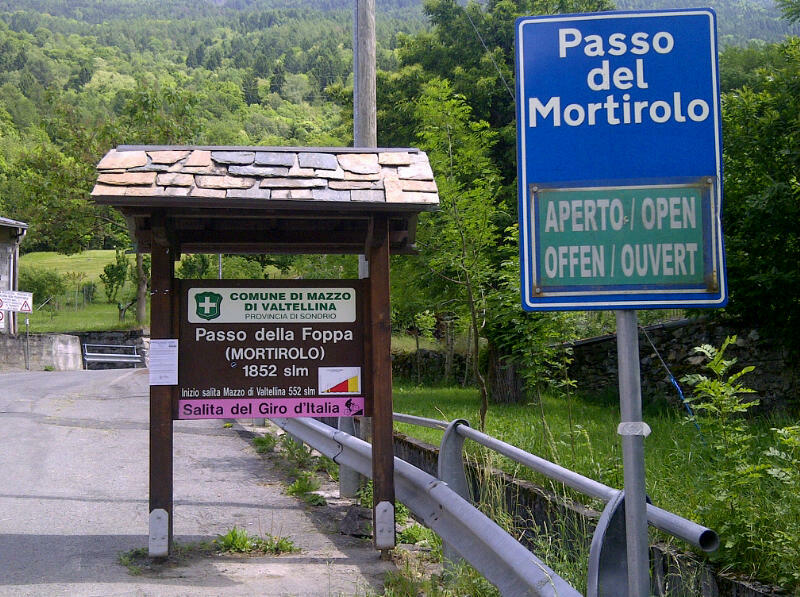 As the Passo del Mortirolo looked relatively local I decided to go there though. The days were long, so I knew I could ride until around 8pm (though I was expecting to be home well before then). 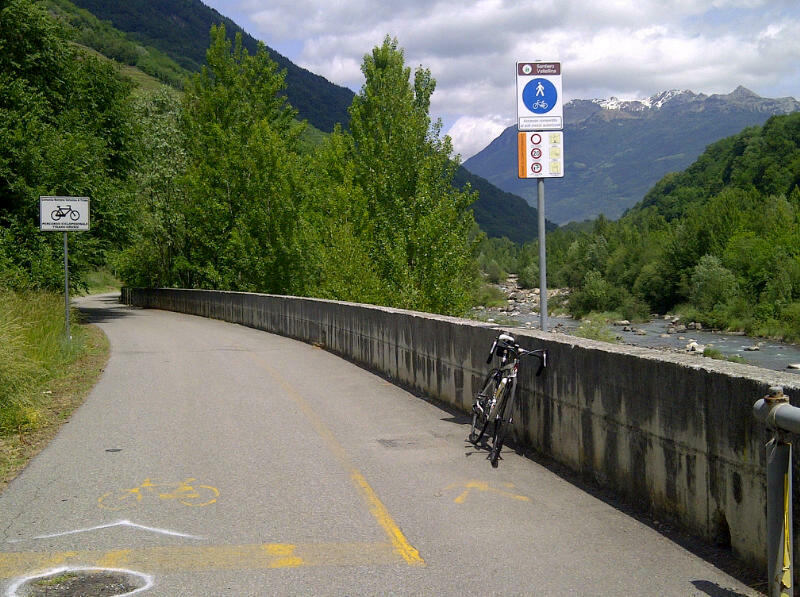 From Tirano it was a very easy spin up a cycle path that followed the Adda River towards a town called Grosio. It's quite scenic as you can see all the high mountains ahead of you and you can relish or even fear the idea of possibly going up there on your bike! Towards the foreground, you are treated to the sound of the flowing water of the river Adda (or what was left of it). There hadn't been much rain so the level was quite low. Nevertheless, folks were still out there tempting their chances fishing in the area. This was quite a pleasant cycle path that could be used by all the family. In fact, there were families out riding on the path - people on all different types of bicycles as well as club riders and a number of runners too. Riding through quiet woodland and past fields, it was very refreshing to be in countryside where I wasn't being attacked by midges and flies, as is often the case in the area around Milan! It wasn't always clear which way I was meant to go, and in fact another cyclist who had overtaken me along the way rode back asking me if I could give him directions. It's always funny when an Italian comes up to me in Italy, asking directions how to get somewhere! Without realising it, this inocuous family cycle path was actually a false flat that climbed steadily, and after about 5 miles I had gained a bit of height and Tirano was now a distant memory some way below me! As the path went further and further into the unknown I could see that I was in proper club riders' country and I began to wonder how soon it would be before I reached the legendary climb. 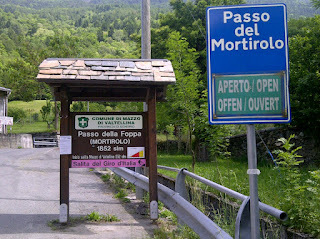 I'd heard alot about the Mortirolo - all scary things - you come to a wall and you freak out, wondering how the hell you are going to get up. Was I doing the right thing only giving myself the afternoon to climb up it?? Soon a club rider came breezing by and I asked him by chance if I was on the right road to Mortirolo. He told me I had passed the turn-off. "But this is the way to Grosio isn't it?" I asked, a little puzzled. "It is," he replied, but the proper way up is behind you." "There are two ways of going up aren't there?" I asked, hoping for him to confirm what I had seen on the map. "There are actually four - come with me, and I'll show you." So I duly followed this guy who didn't have an ounce of fat on him and rode his Pinarello like he was wholly at one with his two wheeled horse. I, with my day pack, long pants and carrying an extra 3kgs of adipose tissue didn't quite move with the same finesse and worked pretty hard to hold his wheel. 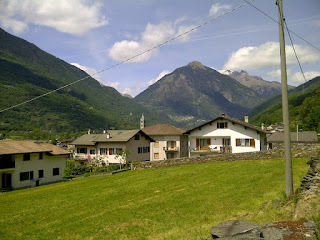 We joined the main road and very quickly reached the village of Tovo Sant'Agata. This was the route that the pros at the Giro d'Italia had taken the previous week. The TV pictures of the slope had looked scary enough, and here we were at the foot of the road that was going to give us 10km of sheer pain. "What sort of gearing do you have?" he asked. "A 34 tooth compact and 27 on the back." I replied nervously. "Hmm, you should be fine with that. The slope is 21% in places." Yikes! Of course I didn't tell him that I had only done a couple of climbs 7% climbs around Bergamo since March. My legs were not quite geared up to ride these tough gradients that beckoned. "Let's have a look at the other options." I responded, relieving myself of this painful challenge. We rode down the road at pace. The guy was a butcher from Grosio called Giulio. He had a pig farm, and worked just in the mornings. Every afternoon he rode his bike around the local hills for about 3 hours. Naturally he looked very fit for his 56 years. Giulio was really proud of this area - for him this was God's country. 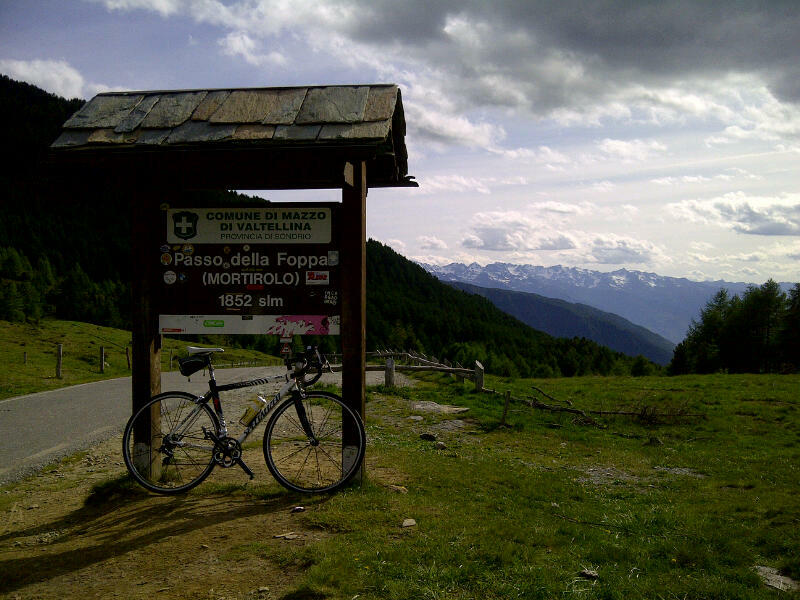 "We have all the best climbs in the world here - Mortirolo, Gavia, Stelvio, Bernina, Aprica. I wouldn't want to be anywhere else." When I asked him if he would be doing the planned cyclosportive that was taking place in the area the following day he gave a fearful look, claiming he was much too slow and too old to be doing this sort of thing. And there was I, with my aspirations of riding La Marmotte cyclosportive challenge, panting just to keep up with this whippet on his afternoon pootle around the local lanes! At one point Giulio drafted off a tractor which was rolling at 20miles an hour up a false flat. I clung onto his wheel, the sweat pouring down my face on this warm June afternoon. I had only been expecting to take it easy until I reached the climb. I was much too overdressed and probably overweight to be doing this! We eventually reached the village of Mazzo where we turned into a little lane which climbed above the village to reach the classic route up the Mortirolo. 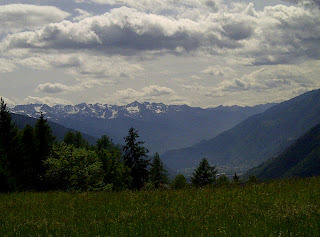 To be honest, even if this had been the most uninteresting, unknown way up the Mortirolo I would have found a way of bidding good bye to Giulio and finding my own way to the climb! I was knackered, and needed a breather. I would have done a training ride just to get to the foot of the climb, and Giulio would be dumping me there all spent up of energy to tackle the ascent! It was better to quit him sooner rather than later! "This is the way to get up Mortirolo," Giulio said. "It is the best way up. Forget about Grosio or Tovo!" And I was glad to. I needed a few minutes to recover before tackling the beast! Well, the reassuring thing was when he bade me good bye, he was actually out of breath and had difficulty speaking! I think he must have been trying to impress me with his Italian speed and athleticism! It's always good to meet a local when out on a bike ride, and I was grateful to Giulio for having shown me around a few places. It had certainly saved me a few minutes of mapreading too! So, here I was in Mazzo, a little hamlet in Northern Italy, on a hot day in June, about to scale one of the most notorious mountain passes in Italy! A few old boys sitting on a wall in the village square gave me funny looks, as I set off up the road. "Don't you have a husband to go with you?" They asked. "Do I need one of those to ride up a hill?" I asked. The signboard at the start of the climb told me all I needed to know - 12km, average gradient 10%, with stretches of 18%. And the climb did exactly what it said on the tin. Nothing more, nothing less! If only it had been less! This was the first time that I was riding significantly above 1,000m and I felt it. The road was very narrow and twisted through the trees. I normally welcome hairpins as they are a chance for respite as the road flattens a little before the next ramp. The Mortirolo is not so forgiving though! The hairpins were actually steeper than the straight sections! There was not much traffic around on this Friday afternoon, which was a blessing. The problem with a working day though, is that commercial traffic is still around, as well as road works. There were a few tractors, vans and steam rollers resurfacing the roads. Luckily the times that they came round was on a section where I could ride easily and tuck into the side of the road. On one occasion I was obliged to speed up around a corner in order to get ahead of an approaching van. I was at around 1600m at this point, and my body really felt it. 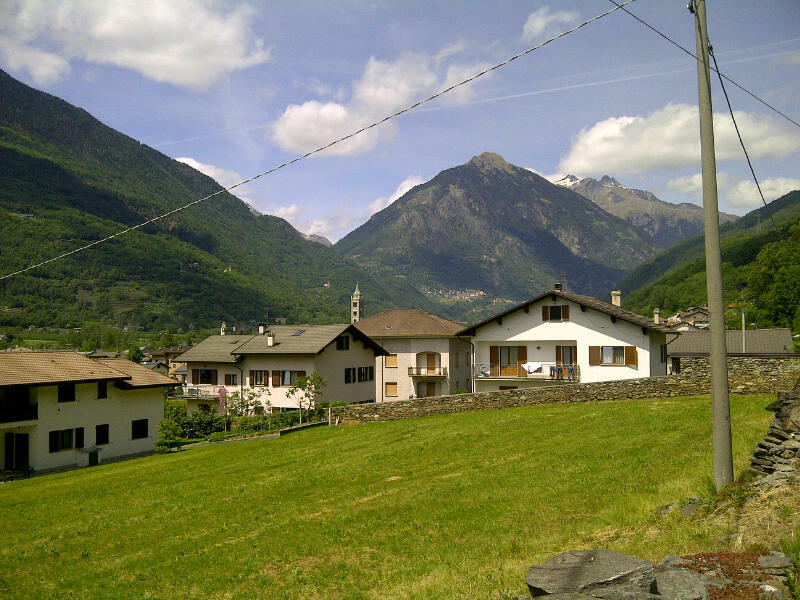 My heart was beating so fast I thought it would burst out of my chest, and my breathing was so loud I was sure they could hear me back in Tirano! Maybe I should have had a husband with me to provide assistance - any husband! It was difficult to see the summit through the trees and there were no km markers saying how much I had left. There were signs counting down the 38 numbered hairpins, and those counted down very slowly! Not all the hairpins were numbered either so there were probably quite a few more than 38 to count down! My only guide was that Giulio had told me that it took him 65 minutes to climb Mortirolo. I immediately estimated it would take me double the time. 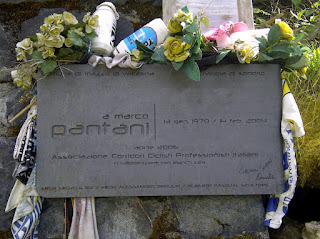 One brief stop I took was to look at the Marco Pantani memorial plaque part way up. It was like a mini shrine to him, with lots of cycling jerseys, bidons and other memorabilia honouring him. The minutes ticked by slowly, as I began to take more rests just after the different hairpins. This was more because I wasn't well acclimatised. (That's my excuse and I'm sticking to it!) Finally, after 2hours and 15mins of grinding away, and at an altitude of 1850m the road opened out and the end came into sight. I wanted to celebrate having conquered the Mortirolo. Shame there was no bar nearby. Instead I contented myself with a celebratory energy bar - not quite the same effect, but hey! Another cyclist arrived at the summit from the opposite direction. He was on a hybrid bike, and admitted he had taken the "easier" way up from Edolo (still 14km at 7%)! 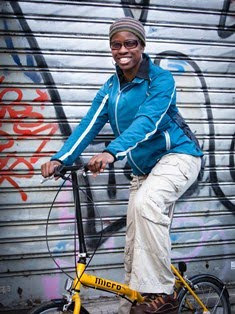 And like Giulio, he was a local who had just ridden up as part of an afternoon jaunt. The locals around here must be mighty fit! My ride back to base at Tirano was lovely. It was all downhill and the views around were very impressive. 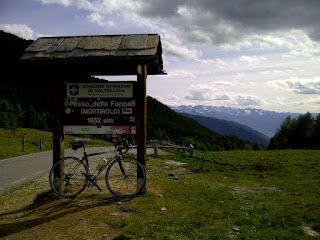 I was very happy to have made it up the Passo del Mortirolo (also known as Passo della Foppa), even if it had been a grind. It hadn't been a pretty way of getting up but I fought through the hairpins, the heat and the racing heart and I had conquered it. I had a smile on my face all the way back to my base. The polenta and beer that evening was well earned! The Hills - er Mountains are Alive....Stelvio! !